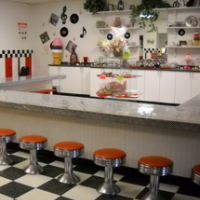 Whether you're looking to have an ice cream party in NY at your house, or go to one of the state's famous ice cream parlors in NY for your kid's next birthday party, you can find it all here. The kids will love having an NY ice cream themed party, so start planning now! Ice Cream That Will Come to You in NY! Why worry about the hassle of making food and buying enough ice cream for the whole party when you can just hire Mister Softee to come to your kid's ice cream party in NY? Mister Softee offers soft ice cream, smoothies and shakes, Good Humor bars, no-fat ice cream, hot dogs, burgers, sandwiches, and more. Your party guests will definitely go home with a full stomach after this ice cream party in Bronx. 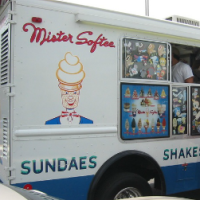 The Mister Softee truck will come to any location that you want, whether it be your back yard or a corporate building. High Quality Ice Cream in NY! Get the finest and purest natural ice cream for your kid's ice cream birthday party in NY at Brooklyn Ice Cream Factory. Your kid and guests will love the sweet, delicious ice cream, along with the wonderful setting in a landmark fireboat house. 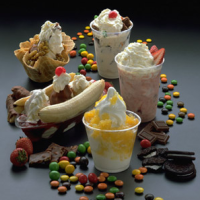 Offering many types of ice cream options, including sundaes, banana splits, milk shakes, and more, the children are sure to find exactly what they want. 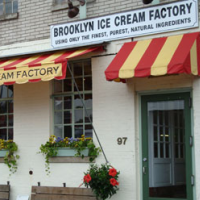 Don't setting for a low-grade ice cream shop - have your kid's NY ice cream party at Brooklyn Ice Cream Factory! Make your Own Ice Cream Sundae in NY! A top NY ice cream party location, the Ice Cream Party Shoppe offers a variety of fun-filled activities, food, and delicious ice cream. 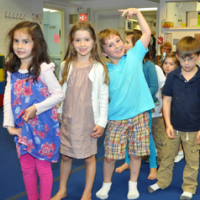 With the choice between two party packages, the Classic Ice Cream Dance Party and the Project Parties, you can decide exactly what types of activities the kids will be doing throughout the party. Between dancing, eating, making eatable crafts, and making delicious ice cream sundaes, the kids will be entertained from start to finish, allowing the parents to just sit back and relax. Ice Cream Cart & Truck Rentals in NY! Have you ever thought about how cool it would be to have an ice cream truck at a party in your home? Now this thought can become a reality with One Hour Parties! 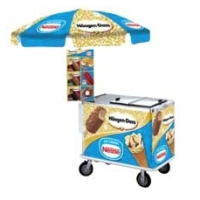 You can rent ice cream carts or trucks, and get some yummy ice cream novelties for your kid's next ice cream party in NY. A guaranteed hit for any ice cream party in NY, One Hour Parties will turn your party from dull to unforgettable with their NY ice cream party services. Gymnastics, Ice Cream & Friends in NY! As one of the city's best party places, 74th Street Magic is a perfect place to hold your son or daughter's next ice cream themed birthday party! Not only can they build yummy ice cream sundaes with the Kitchen Wizardry theme, but they can also spend the day doing cool gymnastics activities. Ice cream, gymnastics, friends and a great time! 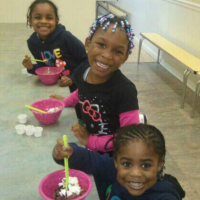 Contact 74th Street Magic today about planning your child's next ice cream party in New York! Ice Cream Sundaes & Fun Activities in NY! Throw your kid a fun NY ice cream party at Once Upon a Sundae! The children will make their own sundaes, eat pizza, do a take-home craft, and do cool activities. You will get to choose your own party theme, and Once Upon a Sundae will customize it for you. Some ideas include Pirate and Princess Adventure, Under the Sea, 'Wii' like to Party, and more. You will have a choice between two party packages, and can also add on some fun extras and party favors. From start to finish, the kids will have a great time! Ice Cream Sundae Bars & Chocolate Fountains in NY! Satisfy your son or daughter's sweet tooth by booking an ice cream sundae bar or chocolate fountain from Chocolate Velvet Fountains for their next birthday party! With a choice between two yummy party packages, you will find just what you're looking for to make your kid's party unforgettable. Along with endless ice cream and chocolate, Chocolate Velvet Fountains also offers cotton candy and popcorn machines. They offer everything a kid could ever want in a birthday party! Old Fashion & Wholesome Ice Cream Fun in NY! Your kid's ice cream party idea in NY can come to life with this fun party place, Little Scoops. 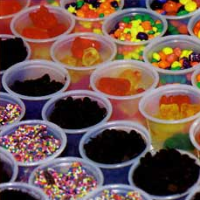 The children will get to make their own yummy sundaes with a large selection of tasty toppings. Also, Little Scoops offers other party food, and also offers activities such as interactive games and music. Choose between the two party packages, and create an ice cream party that fits you and your son or daughter perfectly. Book your kid's party today this wholesome ice cream party venue in NY.